For cord cutters seeking to ditch ever-costlier cable and satellite TV, Sling TV is a compelling alternative, which I first wrote about in “FunBITS: Sling TV Is Made for Cord Cutters” (20 February 2015). It’s a cable-style service, with enticing and affordable packages of leading networks, but delivered online, with no need to set up a special box. I have at times been tempted to jettison my Comcast TV service largely on the strength of Sling TV’s offerings. I’ve hesitated for a number of reasons, not least of which is that I could not access Sling TV on an Apple TV, my preferred video-streaming box. Now that barrier has been removed. 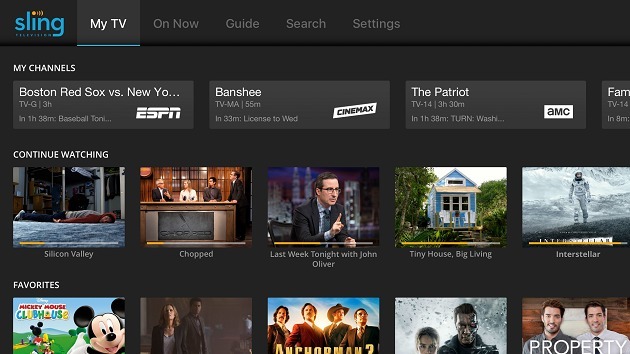 Sling TV has finally released an app for the fourth-generation Apple TV to complement its iOS and Mac apps. Sling is also offering a 32 GB Apple TV for $89, compared to the usual $149 price tag, for those who prepay three months of Sling TV. 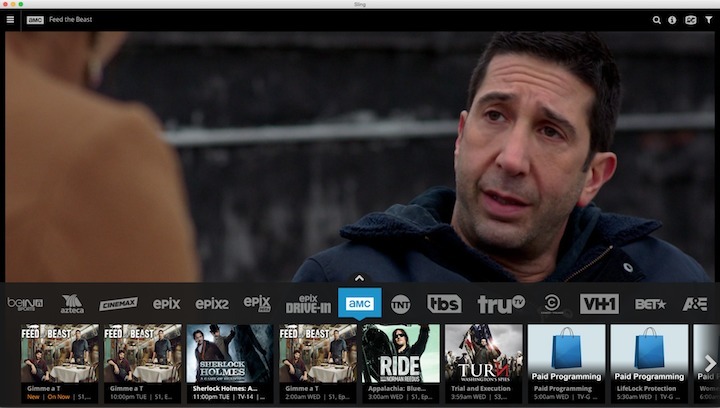 Sling TV’s new Apple TV interface is pretty good. I don’t think it quite matches up to the Comcast X1 interface, another reason I’ve hesitated to cut the cord, but Sling has made great strides in usability since I last reviewed it. 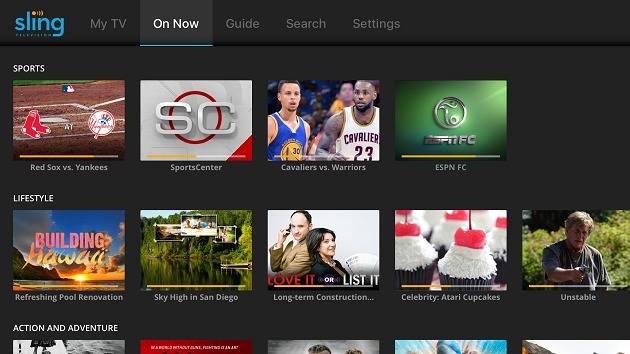 Sling Content — Sling also has significantly expanded its content offerings. It once had only 20 or so channels, and that number is now up to about 100. The company largely divides this lineup between two bundles, the $25-per-month Sling Blue, and the $20-per-month Sling Orange. The two have a good deal of overlap, but also differences. Blue is a “multi-stream” service – meaning you can watch on up to three devices at once – with 42 channels, including new ones like USA, Bravo, and Syfy. It also includes local NBC stations in some markets, with more markets to come eventually. Orange is a single-stream service with 29 channels, including new addition BBC America. Sling also offers an option to combine Blue and Orange (Sling Gray?) for a single $40-per-month fee. If that’s not enough, you can add themed bundles, each $5, that focus on sports, children’s shows, comedy, world news (including recent addition BBC World Service), and more. HBO and Cinemax each cost an additional $15 and $10, respectively. Sling also emphasizes Spanish-language programming, and the company has just augmented its longstanding “Best of Spanish TV” bundle with a “Caribe” bundle focused on Cuba and Puerto Rico, along with a “Colombia Extra” bundle. Such add-ons also cost $5 apiece, but Spanish speakers who want only this content, and nothing en inglés can also purchase them for $10 entirely on their own. Interface for the Live and the Canned — Sling’s vast program options are a blend of live and on-demand content, and various networks have made different decisions as to what ratio of live and canned shows they make available. Accordingly, Sling TV’s Apple TV interface attempts to cluster its content into corresponding sections. It doesn’t do this perfectly, but making sense of it all isn’t hard. To get started, you access the main menu by swiping downward from the top of the TV screen. One menu option, dubbed Guide, is the busiest and a bit tricky to navigate by way of the Apple TV’s touch-based Siri Remote. All available channels appear in a strip near the top. That’s a lot of sideways thumb scrolling to find the channel you want, but you can refine selections by criteria – like sports, news, or family – via a menu underneath the channel strip. Once you select a channel, a host of options appear below. These vary by channel. In some cases, you can select live content and see a schedule of upcoming live airings. In other cases – such as HBO and Cinemax – there’s a wealth of on-demand content that you can watch at any time. It includes movies and TV shows like HBO’s “Silicon Valley” and “Game of Thrones,” for those who like Netflix-style binge watching. But, again, Sling organizes its content into horizontal strips that require endless sideways scrolling. It is torture, for instance, to move rightward alphabetically through dozens of films available from HBO alone. 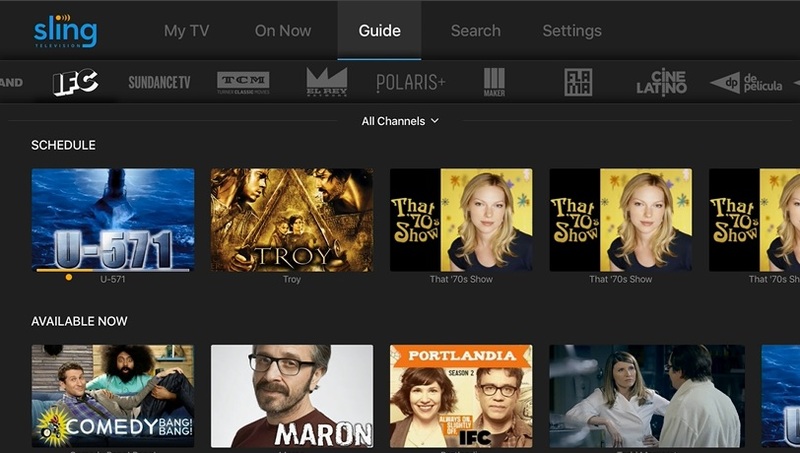 Elsewhere in the Sling TV interface, you can pick the My TV option to see your partially viewed programs and content you’ve favorited for later viewing. Faved offerings include most-watched shows, on-demand movies, and entire channels for a customized and convenient personal menu that bypasses that awkward main channel strip. On Now shows programs that are currently playing live. A redesigned Mini Guide lets you browse through available live content without interrupting what you are currently watching. It takes up less space than the previous Mini Guide, according to Sling. To access the Mini Guide on the Apple TV, swipe upward from the bottom of the screen. Sling TV has a search engine, which you can harness either via an on-screen alphabet interface or by using voice commands spoken to the Siri Remote. The app also provides simple parental controls that let parents prevent access to particular program ratings — along with unrated content. Sling’s Apple TV interface is different from that on the iPad and the Mac, though not exponentially better in terms of interface design. The Apple TV app seems more reliable, though; I’ve struggled to pull up content like HBO’s “Silicon Valley” on my iPad, but that has been far less of an issue on the Apple TV. However, the Mac version has always performed reliably for me. 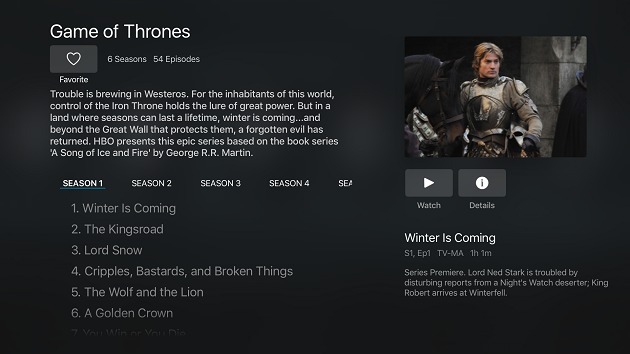 Still, Sling said the redesigned interface debuting on the Apple TV will eventually become its standard look and will migrate to other platforms in coming months. As I was finishing this article, it had already debuted on the Roku. SlingTV provides apps for a variety of other platforms – like Google Chromecast and Amazon Fire TV streaming devices. This broad platform compatibility makes Sling TV an enticing option for those who are tempted to cut the cord amid skyrocketing cable and satellite bills. It's an interesting approach but really, "cord cutting" is a misnomer. You may be able to reduce you monthly bill with Comcast but you won't be cutting any cords if you still want internet service. I signed up the first day it was available on the Apple TV as it is my choice for a streaming box. No words in your article on quality of the video. So we can assume it is always perfect? No buffering? No pixelization? Of course I bring that up because it often (for me) is unwatchable. I can blame TW but other video services don’t have these problems at my house. I signed up yesterday and cancelled today. Freezes and buffering make it unwatchable. I can try watching Food Network live through Sling and experience constant buffering and freezes, immediately exit and watch live through the For Network app (also on my apple tv) with a beautiful, clear, smooth picture. Sling just gave me all the normal tips (check download speed, put device close to router etc) that are NOT the problem, otherwise I'd have problems streaming other apps. No problems here. I powered through season three of "Silicon Valley" (among other things) with nary a blip. I have 50mbs internet, view only one streaming device at a time, have several dozen apps on my ATV4, and have had no buffering, image quality, or access issues on any other app but Slong TV. I really value Sling TV conceptually as an option for viewing my favorite cable channels, but the constant and pervasive streaming issues makes it unusable. I plan to cancel before the 7 day free trial expires, but will keep the app on my ATV's, monitor user forums for upgrade improvements, and give it another try based upon how it's reviewed in the user community. Just a pedantic point BBC World Service is the BBC's worldwide radio station. BBC World News is the TV channel. The cost of TV programming is ultimately decided by the content providers. Various services, whether Sling TV, Hulu, Google, Amazon or the cable and satellite networks, have to distribute the expense of the fees they pay to those providers somehow. Packaging enables them to spread the costs around in groups they think will appeal to different users, but the more channels you want to watch, the more you will pay, regardless of the service provider or the delivery method you choose. The only way to save money is to limit your programming choices. For this reason, among others, cutting the cord is a chimera, a product of unrealistic wishful thinking, fed by overzealous tech enthusiasm. At best streaming services will eventually cut into the cable and satellite networks' bottom like sufficiently to oblige them to lower their prices, or at least stop raising them. That time is not yet. What no streaming service offers, as far as I know, is the convenience of my Comcast DVR, which I have programmed to record the shows I want to watch so I can view them at a time of my choosing. And, no small thing, to zip through the commercials. The time I save not having to search a streaming service or services for those programs, even assuming they are available, pays for the difference in cost, whatever that may be. Not having to watch commercials is priceless. Then, of course, there is channel selection. Unless I'm mistaken, no streaming service, or combination of services, can match cable. If you want to watch local programming, neither can satellite systems. Finally, and no less important, there is the question of video and audio quality. I've got blazing fast Internet service from Comcast, and yet stuff I stream from Netflix doesn't come close to the high-def video quality I get from Comcast's cable TV service. Which, of course, is still a notch or two below Blu-ray. And that's with my router connected to the TV via Ethernet, not WiFi. I can't speak for others; I haven't tried Apple TV for instance. But unless and until streaming video comes across in true (for now) 1920x1080p hi-def, I'll take a pass. And when 4k becomes more common a few years from now, streaming will fall even further behind the curve. Though he doesn't say so in so many words, all this is probably why Julio hasn't cut his connection to Comcast. The only people who do cut the cord, I suspect, are those who can get by on a modest programming diet. I won't presume to characterize them beyond that, tempted though I am to do so. ;-) After all, it takes all kinds.